Sleep is important for people of any age. We all need time to relax and rest while our bodies heal and repair themselves. Unfortunately, more of us are getting less regular sleep than ever before. Sleep is especially important for children. They need to get a good night’s rest so that they can have enough energy for school and play. Video games and other technology are often distractions that prevent children from getting the rest that they need. You can read more online at Sleep Sherpa about different kinds of beds and pillows that can help in getting a better night’s sleep. You can review product specification, pricing and product reviews. You can also find a wide variety of related items at your local big box and specialty retailers. Getting a good night’s sleep can help reduce the chances of your child having obesity, high blood pressure and diabetes. Children who don’t have enough sleep at night often have higher levels of cortisol and glucose. This can lead to higher cholesterol and greater risks of cardiovascular damage due to increased stress. 2. Sleep can help them fight germs. As we sleep, our bodies produce cytokines. Cytokines help us combat illness, infection, stress and anxiety. They also make us sleepy. When children don’t get enough sleep, their bodies are more susceptible to germs and viruses. 3. It improves their attention spans. Children who sleep less generally have greater occurrences of attention deficit/hyperactivity disorder (ADHD) and other impulsive behaviors. They usually have more difficulty with falling asleep and staying asleep at night. This can lead to kids being distracted and tired throughout their days. This can also affect their performance and school and lead to lack of interest in their toys and hobbies. Kids who get a good eight hours of sleep or more on a regular basis are usually more alert and focused throughout their days. 4. Sleep can help them grow. While we are sleeping, our bodies also produce growth hormones. If it seems like your child has grown a few inches overnight, they probably have grown significantly over the course of several nights. Children with good growth hormones also tend to get more restful sleep more frequently. 5. It reduces the risk of injuries. Children who don’t get enough sleep can sometimes be impulsive. Impulsive or clumsy behavior can lead to accidents and injuries. 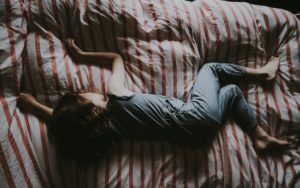 Children who do get enough sleep on a regular basis have lesser risks of such impulsive behavior, and therefore also have generally fewer risks of sustaining injuries or harmful behavior. These are just a few of the many reasons why getting a good night’s sleep is so important for your child. It helps their bodies while they sleep, helps them stay alert and improves concentration and also helps them prevent some potentially serious health risks. Getting good, restful sleep on a regular basis is just as important as a nutritious diet and regular exercise. Setting good sleep habits for your child at a young age can help set them up for a happier, healthier and longer life.